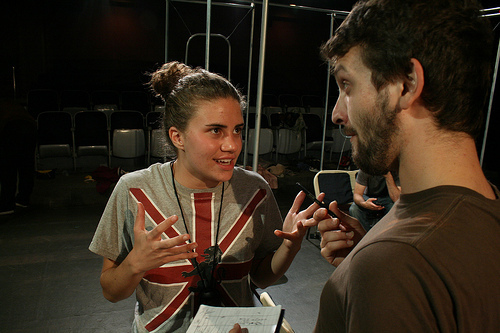 Kelsey Peterson, left, as Adham Fisher. Photo courtesy of Waltzing Mechanics. Last Saturday my 'L' racing partner Danny Resner and I caught a performance of the current incarnation of the show 'EL Stories,' which uses the CTA race we lost against Leicester, England, native Adham Fisher as a framing device. Created by the Waltzing Mechanics theater troupe, the performance piece features a series of vignettes based on stories recorded from actual transit riders. Here's a write-up I did of a previous version of the show. Grid Chicago readers will recall that Adham returned to Chicago in April to reclaim his record for visiting all 143 stations (at the time; two new ones have opened since then) in the shortest possible time, which Danny I beat last winter. Scott Presslak and Kevin Olsta beat our time in early April, who were in turn bested by Rob Bielaski and Ben Downey later that month. During his April visit Adham first did a weekday solo attempt, setting a new record of 9:06:48. That Saturday Danny and I took part in the friendly head-to-head 'L' race with Adham, in which he not only beat us but smashed the nine-hour barrier with a time of 8:56:33. Zack Florent and Keely Leonard from Waltzing Mechanics rode with Adham for part of his journey and interviewed him and fellow passengers. 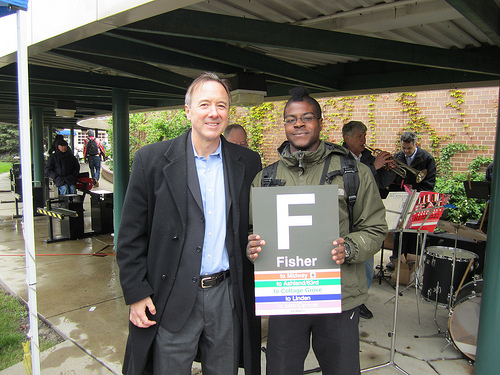 CTA President Forrest Claypool and Adham Fisher at the Linden station centennial before the start of our race. Danny and I don't appear in the show, but they adapted the interviews with Adham into some hilarious scenes, alternated with various stories about funny, poignant or shocking experiences on the CTA they gleaned from other riders. Since the casting is gender-, race- and age-blind, actress Kelsey Peterson does a brilliant job of caricaturing Adham, capturing his focus on details, obsession with his goal and manic energy, delivering her lines at lightning speed in a ridiculously broad English accent. Bystander on train: What's it like when you finish a race? Bystander: But nine hours on the train - don't you ever get bored? Adham: I have a very high threshold for boredom. There are only two more performance left of this production of 'El Stories,' so if you want to see Adham portrayed on stage be sure to go this Saturday or the next. The following Saturday, August 25, the show reboots with a new cast and an all new show, this time featuring interviews with riders on the Dan Ryan branch of the Red Line, focusing on their thoughts about the CTA's plans to close the line south of Roosevelt for two years for reconstruction. Should be a fascinating show. 'EL Stories' runs every Saturday night at 11:00 pm at the Greenhouse Theater Center, 2257 N. Lincoln. Tickets are $15. 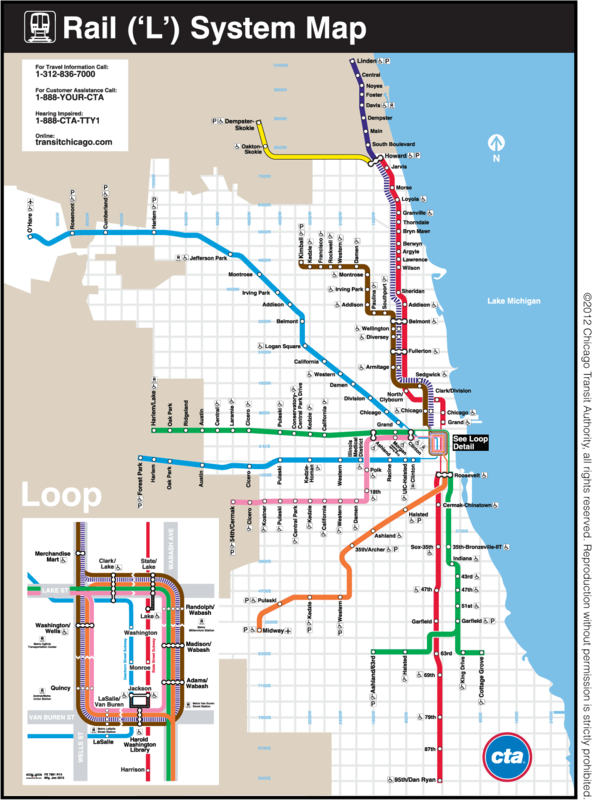 CHICAGO (CBS) A Leicester, England, man is looking to reclaim the record time for riding the whole CTA 'L' system, after three other teams broke the record this year alone, according to a published report. 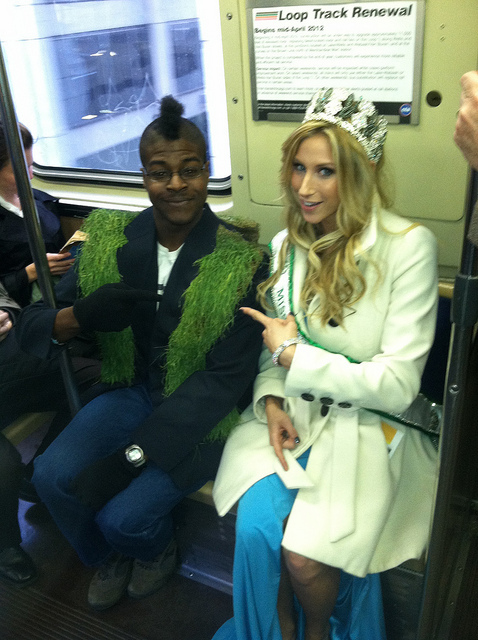 Adham Fisher, 27, set a record time for riding the 'L' in March of last year. He raced around all 143 stations in 9 hours, 36 minutes and 33 seconds, and was written up in Time Out Chicago. He was awarded with an honorary 'L' sign with his name on it by CTA President Forrest Claypool. But the record didn't stand for very long. Danny Resner, 23, an editor for the Cricket children's magazine, was joined by John Greenfield, a writer for the New City and Grid Chicago, in an effort to beat Fisher's time. They succeeded, coming in at 9 hours, 30 minutes and 59 seconds this past Feb. 3. Another duo, Scott Presslak and Kevin Olsta, set a new record on April 6, coming in at 9 hours, 24 minutes and 5 seconds, Greenfield reported in the New City this week. And on April 11, yet another new record was set by Ben Downey and Rob Bielaski of Chicago. They came in at 9 hours, 8 minutes and 56 seconds. Upon setting the new record, Downey said he thought the record-holder should be a Chicagoan, not someone from overseas. "It's funny, there's a British guy who does this stuff?" Downey told WBBM Newsradio's Mike Krauser earlier this month. 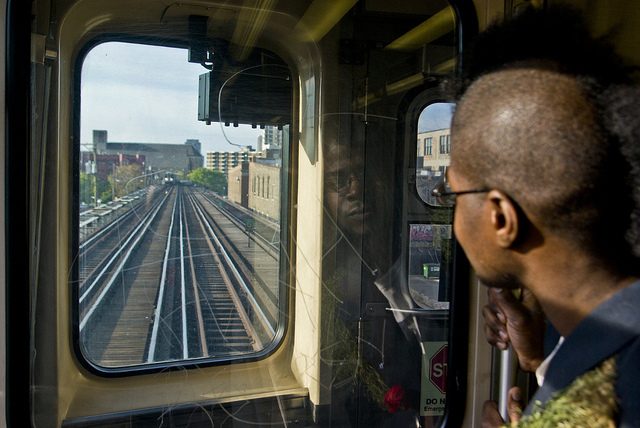 "Does Chicago have no pride, like, isn't the CTA cool enough for Chicagoans?" But now, the tenacious non-Chicagoan who the set the record last year is back in town, and the New City's Greenefield reports Fisher has been planning to reclaim the record. He was to make solo attempts to set a new 'L' travel time record on Thursday and Friday, Greenfield reported. In the time since he set the old record, Fisher has also set a record for riding the Toronto subway, hitting 69 stations in 2 hours, 46 minutes and 1 second, Greenfield reported. But he fell 19 minutes short in an effort to ride the whole New York City subway system, riding through all 468 stations in 23 hours, 11 minutes and 24 seconds, Greenfield reported. 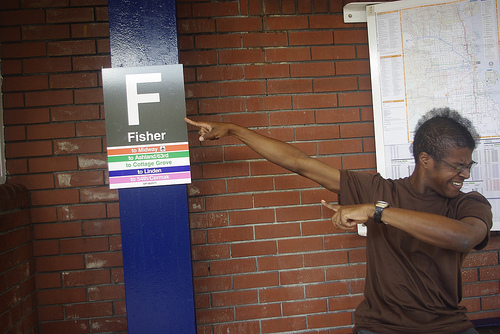 Meanwhile, Fisher has been getting celebrity treatment among Chicago transit geeks. 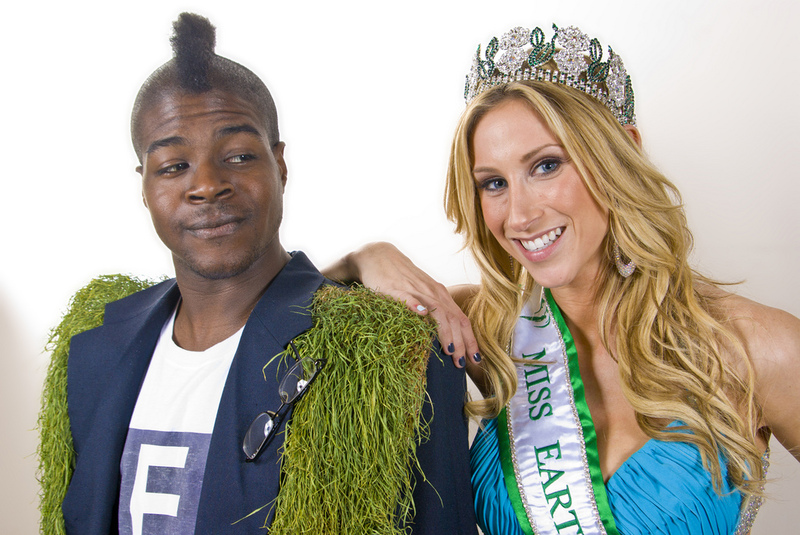 Greenfield says on Tuesday, Fisher put on a living sod sports jacket by artist Joe Baldwin and joined Miss Earth Illinois Nikki Huber to canvass the 'L' promoting Baldwin's latest sculpture show. On Saturday, Fisher is set to appear at an event to celebrate the 100th anniversary of the first 'L' train run to the Linden Avenue Purple Line terminal in Wilmette. The service was introduced in April 1912 by the Northwestern Elevated Railroad. After Chicago Transit Authority President Forrest Claypool's speech Saturday, Fisher has invited all the teams that beat his record for a friendly 'L' riding race, Greenfield reported. They will leave together from Linden, but branch off in different directions soon afterward, according to Greenfield. 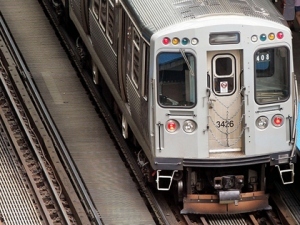 "Since a handful of Loop stations will be closed for weekend track reconstruction, we won't be vying for a new record, but it will be interesting to see how the different teams fare on a level playing field," Greenfield wrote. After the race, Greenfield says he and all the record-setters will head to the Greenhouse Theater Center, 2257 N. Lincoln Ave., for a staging of "EL Stories," a play featuring real stories from CTA commuters. 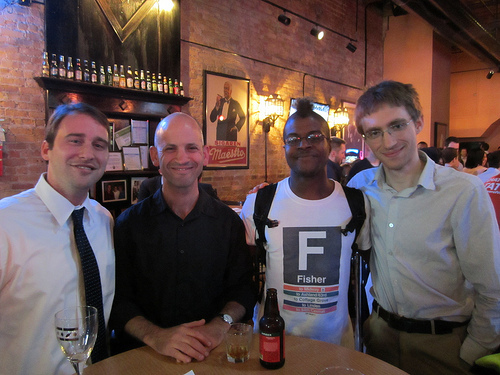 "EL Stories" is onstage at the Greenhouse every Saturday at 11 p.m.
A CTA racer's summit: Fisher (wearing a t-shirt based on the honorary station sign the CTA sent him), minutes after setting the new record, meets up with Bielaski, Greenfield and Resner to toast his triumph. Adham Fisher has done it again. 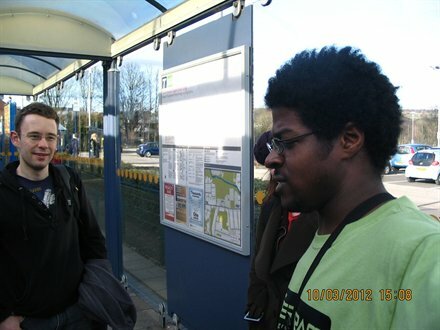 In March 2011 the globetrotting Leicester, England, native set the world record for visiting all 143 CTA stations by train, only to have the title stripped from him by Chicago residents Danny Resner and yours truly last February 3. On April 6 Chicagoans Kevin Olsta and Scott Presslak beat our time, but were bested five days later by locals Rob Bielaski and Ben Downey, who brought the winning time down to 9:08:56. Fisher is currently back in town, not on a busman's holiday but a subway racer's vacation, participating in a slew of transit-related events. You can read background on the cutthroat competitive CTA riding scene and Fisher's packed Chicago transit geek itinerary in this week's Checkerboard City column in Newcity magazine. After doing research on Wednesday, Fisher rode the entire system yesterday and set a new record: 9:06:48. This Saturday 4/28 following remarks by CTA President Forrest Claypool at the 100th anniversary celebration for the Purple Line's Linden station in Wilmette, Fisher will engage in a friendly 'L' riding race versus the team of Resner and myself. Grid Chicago readers are invited to cheer us on as we depart from Linden, or even join us in the competition. 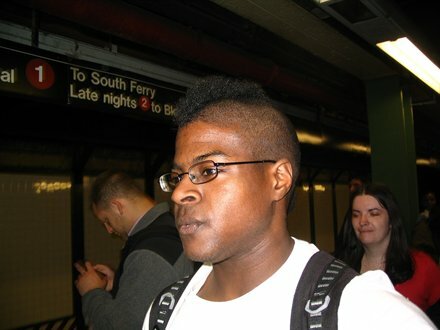 This is Adham Fisher, 27, of Great Britain, subway rider extraordinare, pictured here in New York where he made a bold effort to complete the fastest journey to every station on New York's sprawling subway system. 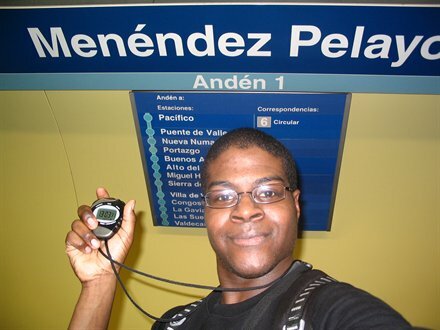 After spending over 23 hours on trains passing under and over the city, he was eighteen minutes and 48 seconds shy of the world record (which stands at 22 hours, 52 minutes, 36 seconds). Undaunted, he moved on to Toronto. Citizens of that city hold records for the longest ever church organ performance (40 hours, 36 minutes) and for the most people carrying jugs of water on their heads at one time (282), both achieved during an extraordinary spell last summer, yet no one appeared to have tested body and mind by racing through the subway system. Mr Fisher promptly wrote himself into the history books, completing the system in two hours, 46 minutes and one second. Brad Ross, of the Toronto Transit Comission, said that in the absence of any other recorded times, Mr Fisher had achieved a record "or at least a personal best." Mr Fisher also achieved fame. "I was on the front page of the free Metro newspaper, which all the commuters seem to read, so I was being recognised all over the subway and was asked by three different people to sign their papers," he said. "That was excellent, albeit a little strange." Asked why he does what he does, he tends to reply as George Mallory once did of Everest, that he wishes to conquer any given underground railway system "because it's there". He would not call himself a train spotter or rail enthusiast "because I know nothing about rolling stock, track guage, infrastructure or anything like that; all that matters to me is going around a network as quickly as I can." He told us this by email. He also made some general observations from his time racing subways: "New York has a lot of soliciting on the trains, Paris and Madrid have a lot of busking on trains and platforms. I think that those systems could be slightly less regulated than London because of that, and may homeless people do sleep within the New York and Paris systems too, in full view of anyone. I have not really seen anything like that in London. But there is certainly entertainment of some sort to be seen on every underground system." New York, he says, was "the hardest system yet". Now he is back in Chicago, where he set a record of 9 hours, 36 minutes and 33 seconds last Spring. That was then broken by the editor of a children's magazine and a transportation blogger, their record was then beaten by two men who utilised buses to travel between stations, and their record was then beaten by two other athletes of the 'L', who smashed the 9 hour and ten minute mark with a time of nine hours, eight minutes and 56 seconds. How long can that time stand, now that Mr Fisher is back in town? 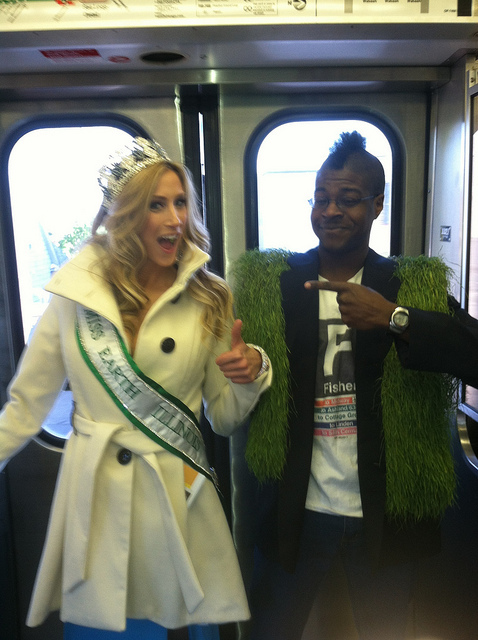 He emailed earlier, saying he had been received "with bemusement so far", although this was partly because he was wearing a jacket made of grass and journeying about the city with 'Miss Earth Illinois'. On Thursday and Friday he will make two efforts to conquer the system, aiming to break the record come L or high water. Recently we brought you news of Adham Fisher, an Englishman who elevates the business of riding subway trains to the level of an Olympic sport (not, perhaps, to the level of the one hundred metres, but perhaps to a par with show jumping or rhythm gmnastics). Mr Fisher travels the world attempting to set the record for the fastest time around a city's railway system. Earlier this month, after missing, by eighteen minutes and 48 seconds, the record in New York (which stands at 22 hours, 52 minutes and 36 seconds) he set a record in Toronto of 2 hours, 46 minutes and 1 second, (at least as far as anyone could tell). Last week he moved on to Chicago. There the record he set last spring, (9.36.33) had been broken repeatedly by locals aghast at the idea that a foreigner might be better at riding the entire "L" train network than anyone living in the city. On Saturday he reclaimed his title, with a time of nine hours, six minutes, and 48 seconds. "It was emotionally wrecking because I lost time in the middle of the day, then hit my slow zones," said Mr Fisher. "Towards the end the atmosphere was very tense and I cried on the final platform when I saw the time - I didn't think I'd make it. It's disappointing not to have gone faster but this might encourage more competition. Breaking the nine hour mark is definitely possible. Who will do so first?"